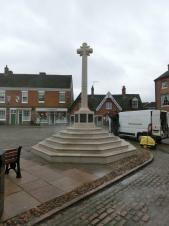 The Parish Council is responsible for Market Bosworth's War Memorial which is located in the heart of the town in the Market Place, as well as the Memorial Gardens located on Park Street. These are dedicated to those who gave their lives during the First and Second World Wars. The Parish Council is also responsible for the Churchill Memorial Cairn located on Station Road. This is a specially commissioned memorial to mark the dedication and sacrifice of the Churchill brothers and those involved with the JJ Churchill factory which relocated from Coventry to Market Bosworth during the Second World War and which still operates in the town as a specialist precision engineering firm. The Churchill brothers took part in the Second World War and the staff worked on plane engine components, a vital part of the home front war effort.